This morning I made a little ladybug from tomato! Am quite happy with the result as it didn’t take much effort but looks pretty! 😀 Wanted to do more but I could not locate my flower cutter and also I woke up late this morning. Fortunately that my maid helped with the preparation of most of the ingredients like frying the bacon. Oops! Now only I remember that I got her to steam some corns but I totally forgot to put it into my bento!!!! That shall be my supper tonight then. Haha! I had a BLT Whole Wheat Bagel with the lettuce, dried cranberries and carrot flower garden. 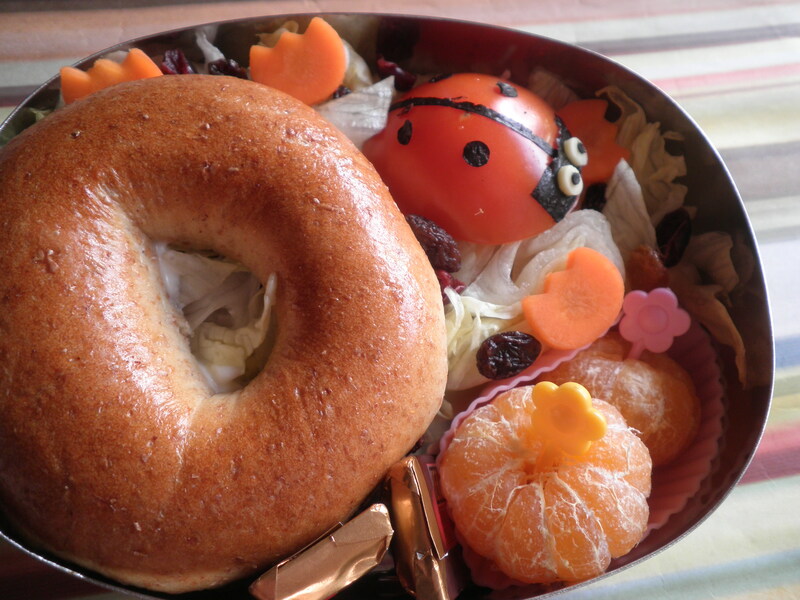 Had two little sweet tangerines again and of course my Ladybug!! Also a little treat, I had two mini Hershey’s dark chocolate. 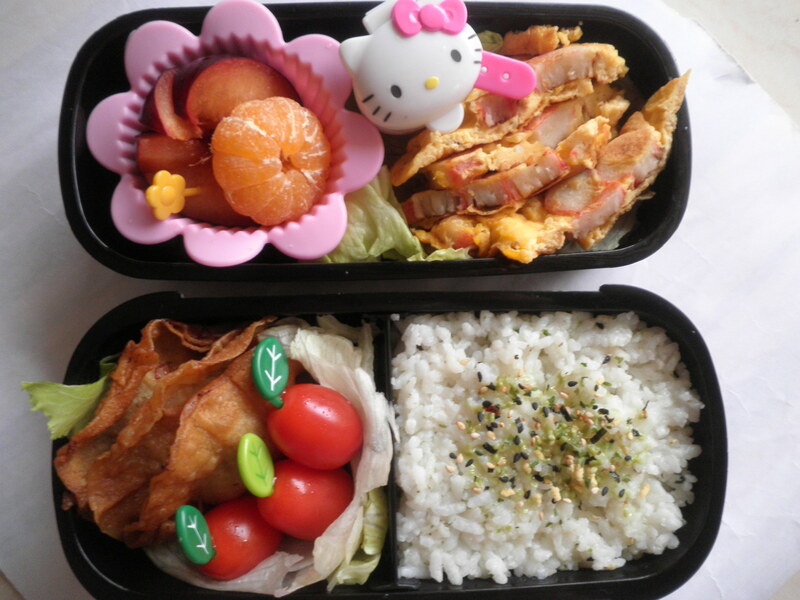 Am so glad that I am back to making my bentos! Of course doing these make me want to buy more bento stuff again and with Christmas around the corner, am making excuses to get them as gifts! Haha!!! Looking back, I think its been slightly more than a month since my last post. I had been both lazy and too busy to make any and worst of all, I didn’t even follow up on all the great bentos that had been made by my fellow bento frens on Twitter. Had some major life planning to do during this time of absence and is still going through the plans as well as putting some into action. I guess it’s the year the end effect, when you realized you didn’t really achieve any of the new year resolution you set 11 months ago and now trying desperately to at least cross some of them out. Haha! Anyway, I told myself that I shall start making my bentos again, though its time consuming a.k.a less sleeping time and I did! I actually made a lunch bento! If you’ve been following my post, most if not all my bentos are usually breakfast bento. I think making lunch bentos are a lot easier as there are wider options of food to put in. But I do plan to make an all American breakfast bento one of this day. It will be most sinful but yummylicious! Haha. My lunch today comprise mainly of yesterday’s dinner leftover. I made my own wanton yesterday with minced pork, carrots and onions. Made a special cucumber and tomato sauce to go with them but that’s finished during dinner and so I could only have plain tomato sauce in this bento, stored in the HK box. There’s also the crab stick omelette that I made for my daughter and nephew. The rice was my key challenge in making this morning. Coz for the first time I tried to reheat frozen rice in the microwave. I put some water into the freezer bag which contain the rice and put it on the steam function for 6 mins. It came out hot and nice! I then mixed it with some wasabi furikake. For fibre and vitames, I’ve some lettuce, cherry tomatoes, slices of plum and a tiny little tangerine.